As you all might know, I started speaking out about my struggle with depression last year in November. I’m still going to speak openly about it in the future, but this week, I want to share with you that I along with several of my awesome blogger buddies will be sharing stories and tweeting out to shed light and BE light to those who also may be suffering with this disease. Yes. Disease. It’s a sickness. Being able to understand it and how to interact with those who are affected is so important. I do believe that my depression started a long time ago, but I finally was compelled to speak to someone about it when my husband gently suggested that maybe it just wasn’t me not getting back to myself after having the twins. The moment that I decided to step out of the dark place that I had become comfortable in, was the moment that I begin to live on purpose. Sure it’s been a bit uncomfortable, but I’m not doing it alone, and I don’t have to. For every moment that I feel that I am not important enough to anyone, I have 10 where I get random messages from friends that I don’t think are thinking about ME. I’m told that I am an encouragement to THEM because I openly documented my struggle and even brought to the forefront the stigma that black Christians seem to have with the subject. So, now that I fully have your attention I can probably answer the first two questions that popped in your head. 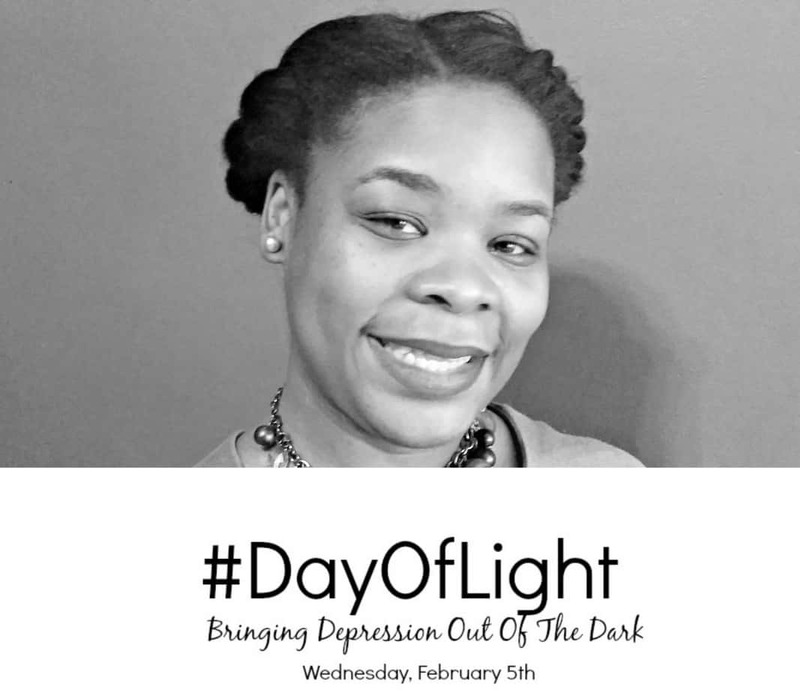 #DayOfLight is the brainchild of Brandi from Mama Knows It All who has learned of three people succumbing to the disease in the last couple of months. She approached those of us who have openly written on the subject, and some who have not through our Pushing Lovely Community, and the wheels were set in motion. We are asking folks to share stories of how depression has affected them through blog posts and social media shares. We will be sharing out resources and help all day. There will be a live stream Hangout on Wednesday, February 5, at 11 AM EST, and a twitter chat at 9 PM EST. More information will be available throughout today and tomorrow. What Can I Do To Participate? I do love that I will be among some very talented and very wonderful bloggers. We are opening our hearts and our virtual homes for everyone to share stories and resources. We are not in any way attempting to give medical advice, just sharing, and encouraging those who may be suffering with depression to know that they are most certainly not alone, and they can always seek help. I am off to see my therapist later this morning, because it’s a long journey to getting back to that spunky Natasha I was in college. That carefree Natasha that took no prisoners! I’m getting there. One day at a time, I’m getting there. If you want to read my back story, you can read them here, here, and here. I look forward to hanging out with you all on Wednesday, and keeping the doors of communication WIDE open, because we are totally responsible for each other, and each of us is a BRIGHT light and deserve to shine on. I like the idea of various bloggers working together, telling their own stories in an effort to make the world a better place. Thankful for the folks in our lives who encourage us to get the help that we need. It can be so hard to see it in ourselves (especially when we think we have no reason to be “sad”). Thank you for being a cause leader! I discuss mental health illness a lot on my site and I share my depression story as well, which is hard in itself to do. I recently wrote an article about our black men, depression and suicide last week. I would be HONORED to participate in #DayOfLight and will share with my readers as well as my twitter followers. Depression is real, but no one wants to talk about it and that therein lies the problem. Great site btw, found you through blogher. Thank you for sharing. I cannot wait to follow this hashtag all week. Thank you for doing your part & sharing your story! I don’t think that it’s just black Christians that have a stigma about dealing with anxiety and depression. I can’t count the number of times I’ve heard “You just need to pray more.” or “Let go and let God.” I’m so glad that you’re all doing this, and hope to get something together to participate.